Sydney Shop Girl: In Quarantine. 'The Year of Living Danishly' - Helen Russell. In Quarantine. 'The Year of Living Danishly' - Helen Russell. It's not been the most glamorous or exciting of times at SSG Manor. Toddler SSG and I are in quarantine. Again. Our days have been punctuated with the lime green beeps of my trusty Braun ThermoScan and I've been keeping my movements to a minimum thanks to various remotes, cordless phones and my waterproof and shock resistant powerpack. The only fluid I can actually taste at the moment is Coke Zero and I've been rationing myself to half a tumbler with lunch. Actually, it's not so much the taste that gives me a bit of a lift, it's the bubbles and its icy cold temperature as it hits the back of my scratchy throat. The non lamb ingredients for Lamb Obsession. My freezer full of slow cooked dinners has proven to be my poor girl's version of a personal chef. As odd as the ingredients for Lamb Obsession may sound, I'm actually counting myself among its slow cooker community fans. The slow cooked forequarter chops I used ended up being fall of the bone tender, even though I trimmed them of all visible fat. The gravy ends up being pretty thick with that comforting taste that brings back memories of childhood dinners speedily created around cans or packets of soup mix. Another success I've been dining on via the freezer are Danish Meatballs in Mushroom Sauce which I also made in the slow cooker. They aren't quite as rich as Swedish meatballs and you don't add any potato to the mince. I got my berry sauces mixed up and had mine with cranberry sauce rather than the more Scandinavian Ligonberry. Staying on the Danish theme, I've just finished reading The Year of Living Danishly by Helen Russell. I really enjoyed it. It was just the thing to read on the sofa under throw rugs as I willed this horrible flu to disappear. 'The Year of Living Danishly' is Helen Russell's memoir of her first year in Denmark. The chapters are divided into months. In each, Russell recounts various aspects of daily life she discovers as she attempts to assimilate in rural Jutland fresh off the plane from London with absolutely no spoken Danish. 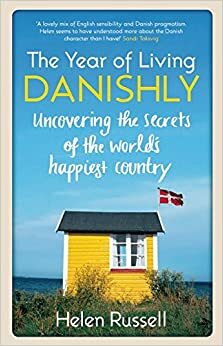 The chapters also serve to explore elements of Danish life as Russell sets out to discover just what makes the Danish among the happiest people in the world. Russell interviews various experts on Danish life and asks them to rate their happiness out of ten. Most score their lives as 8 - 9. I really enjoyed how Russell didn't just focus on Scandistyle and food but also broached the more mundane aspects of life in a new country - tax, education, health care and the social issues facing Denmark. As frustrating as these days of sickness are, they do force you to appreciate the little things that can make you smile each day, if only you'd let them. Mum's been sending me photos from Perth that she's taken in her iPhone. There are lots of my nephew as well as ones of interesting places she's stumbled upon in her travels. Like Perth's entry in Restaurant Revolution. Mum had a lovely chat to a staff member who explained the whole premise of the show and let her have a bit of a tour inside. So, thanks to mum, I'm full bottle on Restaurant Revolution. It's been lovely being able to put away laundry that still warm from the sun as we head into spring here in Sydney. Hopefully, we'll both be well enough soon to get back out in the sun in our finery. I stepped out in a favourite pair of Rockport 'momheels' to meet my cousin for afternoon tea last week. We went to the Tea Room at the QVB. And on that decorous note, I'd best be off. Early dinners and bedtimes are the order of the day for SSG Manor right now. Here's hoping I'll be lipstick ready by the end of the week! Hope you feel better soon! There's definitely being something going around. Caught up with all the mummies we had missed last week on our playdate and they sounded terrible, although the toddlers were better. Now of course I'm starting to feel those signs of sickness too. I'm hoping it doesn't hit too heavily, and that it passes baby T by.... Fingers crossed you both recover quickly! That afternoon tea looks sumptuous! Is that an ice cream sandwich macaron?! If not, someone should invent it. I hope you both feel better soon and your freezer meals keep you sustained. And the slow cooked chops sound DIVINE!!!!!!!! Feel better soon!!! And, for more Danishness, you might enjoy "Rita," if you have Netflix. A Danish TV series about a teacher:). Have you seen it?